This Second edition contains consise information on 134 carefully chosen named organic reactions - the standard set of undergraduate and graduate synthetic organic chemistry courses. Each reaction is detailed with clearly drawn mechanisms, references from the primary literature, and well-written accounts covering the mechanical aspects of the reactions, and the details of side reactions and substrate limitations. For the 2nd edition the complete text has been revised and updated, and four new reactions have been added: Baylis-Hillmann Reaction, Sonogashira Reaction, Pummerer Reaction, and the Swern Oxidation und Cyclopropanation. 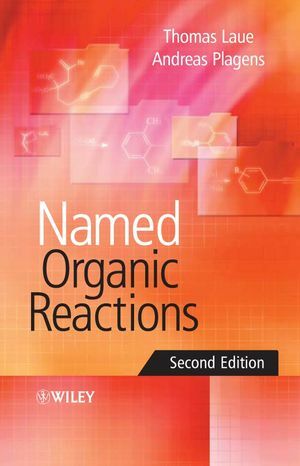 An essential text for students preparing for exams in organic chemistry. Thomas Laue and Andreas Plagens are the authors of Named Organic Reactions, 2nd Edition, published by Wiley. Introduction to the 2nd Edition. New paperback version offers book at an attractive student price.